Sorry, could you recommend a good book about gnuplot?. 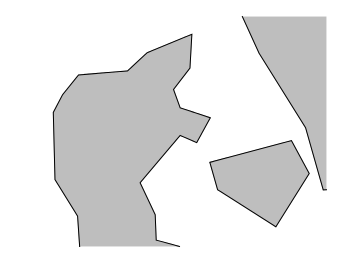 I plot three maps of globe using the three resolutions respectively. the first and third plot may have bugs. some place is blank. @jack: yes there are some bugs regarding filledcurves plots with the data. That is mainly due to the order of the data in the file. For the 1:110m file I have corrected the data, for the 1:10m it need some work. @hagen: thanks for reply. I have two more questions. 1. Could the heatmaps be interpolated? sometimes, smoothing plot looks better. 2. Could the zlabel of pm3d be rotated? if string of zlabel is long, it will take much width of plot. 1. I’m afraid you have to interpolate your data matrix in order to interpolate the image. I have corrected all data files in order to work correctly with the filledcurves option. I have also added the Antarctica at the bottom of the files seperated by two blank lines in order to use the index option to generate a plot with correct filling of the Antartica. If we plot by the following command, we will get Fig. 5. If we use the index option and set the reference of the filledcurves to the x-axis for the Antartica, we will get Fig. 6. Hi, hagen. As heatmap can’t be interpolated. I use pm3d to complete interpolation. Also, I want to plot world on the same image. Would you please tell me how to do this? That is a nice trick. I will write an entry about heat map interpolation. For including the world, it is easy with the 3D version, there it just works. For the 2D version we need to align the 3D and 2D plot. That I will discuss also in an extra entry, sometime the next weeks. Thanks. 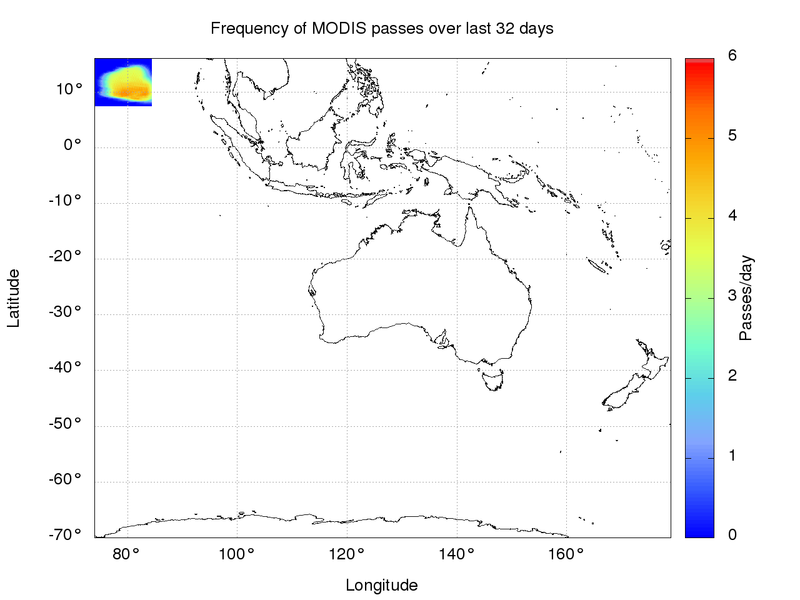 I created a 1:10m of southeast Asia and plotted the frequency of MODIS satellite passes per day (http://d.pr/i/SDXx). Not sure why my gridlines change from grey to black? 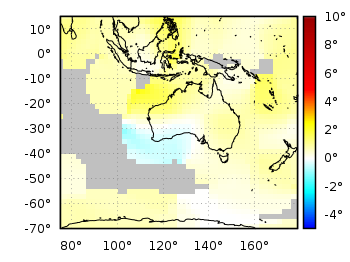 I have created a plot from the same region with the temperature data from the heat map entry and the grid looks fine. What exact terminal and code for the grid did you use? I have found the error. You scaled up your tics in a way that they cover most of the graph, and they are in front of the grid. and now your grid looks fine. Don’t wonder that the MODIS data are not aligned, that is due to the fact that the range of the x and y values in your given data file are only in this region. Thanks. It looks better now (http://d.pr/i/50bp) with the spatially correct frequency data file (http://d.pr/f/aoHT). Sorry I uploaded an earlier incorrect test data file. Look forward to your next entry. I am plotting a 3D plot of temperature map on a cylinder. My plot is created from a .dat file with four columns as well. Instead of your “world” I am plotting onto the temperatures the contour lines of the temperature field (how I have created those it is a long story and I can explain it in a further comment if you wish). My problem is that after plotting the temps pm3d + contours lines, the “theoretically” hidden contour lines can still be seen. In your 3D plots of the world temperatures this doesn’t happen. I am wondering if you can give me a hint. The only difference I can see so far is that I am not plotting the cylinder itself and that I am using cartesian cordinates to define the points for both, the temperatures and the contour lines. If you plot both the contour lines and the temperature data, the order of the two commands matters. For example, above I plotted first the contour lines and in the second line the temperature data. If this doesn’t help, I’m afraid I have to see your code in order to help. Thanks your for promt reply. I have been working on it and basically trying to do all the steps you did to make your plot. The hidden contours finally disapeared when using the “hidden3d front” and plotting the cylinder mesh. If any of those two is missing, the hidden contours appear again. As you showed in your code, first plot the temperature data, then the mesh and finally the contours. Now I have got a problem I never really knew how to solve. The length of my pipe (in z axis) is ten times the diameter (in xy plane). How can I fit everything in the screen? if your z axis is ten times as large as the other ones. After spending some time with the terminal or canvas size finally I found the way to fit the plot inside. The “set size” command scales the plot relative to the canvas size, as said in the gnuplot instructions. And that did it! Then it is also necessary to play with “set origin”. Otherwise the plot is not located in the proper relative position. set size 1,0.27 #scales the plot relative to canvas size. I used your map for Mediterranean region and noticed that the Italic and Greek islands (Sizilien, Rhodes, etc) are not filled with a color. Could you please correct the case? but in this case the axes have also changed somehow. The longitude sis OK but the latitudes are now corrupt (with about 3 degree). Could youl please help me to solve the problem? To use only a little region works not always out of the box with filledcurves. The islands seem to be ok for me. 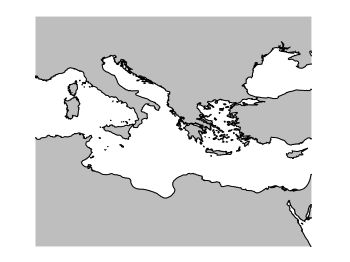 Here is a plot of the Mediterranean region. But if we do the same with Italy, we get a corrupted picture. Now we have to plot different regions at different times and set different reference lines for filledcurves. For the Mercator projection I think you can solve your problem by looking at this comment. 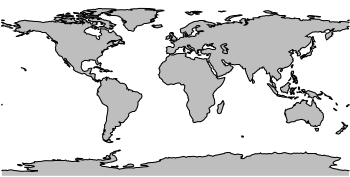 But thank you for the idea, I have created a new entry discussing the Mercator projection. on top of this revised world plot ? I don’t need plot an heatmap, more simply a set of landmarks. A code example would be greatly helpful. that’s relatively easy if you have the points already as latitude, longitude pairs. For example assume a file containing the following random points somewhere in Denmark. That will give you Fig. 11 as result. Should be the same for the 3D plot with splot. I wanted to mention, that the current development version of gnuplot fixes some clipping issues related to the ‘filledcurves’ plotting style. 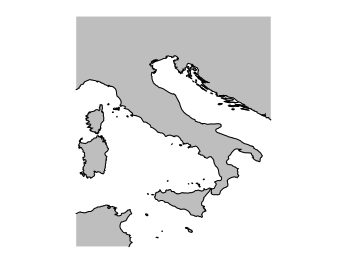 The image italy.png created in hagen’s comment will be plotted correctly. This will be very cool, and helps a lot to use gnuplot for cartographic plots. Is there a way to plot a 3d globe with color (ocean as blue, land as green, and Antarctica as white)? unfortunately this is not easy. The filledcurves option is not working for 3D plots. The only way to do it seems to be to have data points for every point on the globe which specify in a third column a value that can be used to choose a color. The data file from this post specifies only points between land and water and is not suitable for such a task. Hi. I ended up making a file containing coordinates and their colors (first I produced a 2d png picture using the ‘world_110m.dat’ file; then converted it to bitmap; and then used a hex editor to extract the colors for each pixel). Now, how do I go about plotting it as a globe with color (couldn’t figure it out)? If you have a file with points and colors you have to add a fourth column, something like splot 'file.dat' u 1:2:3:4, as you can find in this example plotting temperature data on the globe. Hi and thanks for the help! I succeeded in the “drawing trajectory problem” without your help, i’m so proud of myself ;) but now i have some other problem.. I’m trying to plot simple point on the map, i have a file with coordinates of the station (http://guidocioni.altervista.org/coordinate.txt) that i’m trying to plot using this script. I’m able to get only the map.. what i’m doing wrong? You have to check what are longitude and what latitude data. I was able to plot the points. god, no.. i was raging all the time , and it was so simple…. I feel so stupid right now. Hi, i have another good question. I’m trying to plot on the same map, 2 point trajectories (i have done that) and 2 contour maps. I have 2 txt files formatted as “latitude longitude value” and i’d like to play that value as contour on the same map of the trajectories. Do i have to interpolate the data? Is there a simple way to do this? The final image would eventually have the earth basemap (plotted as suggested here in this article), the 2 trajectories (already plotted) and 2 contour map (maybe one filled and one not in order to differentiate). Is there any update to include the great lakes in N. America? Some of th emaps look rather odd with them filled in. Also, how do you get the Caspian sea to show up as blue? the contents of this page is certainly very interesting, esp to someone who his new to geo as myself. my question is about the actual data geo shape file (the one that contains lat, lon points one point per record). is there some implied ‘winding rule’ in terms of the sequence of how the points are defined, relative to how the geo renderer (gnuplot in this case) will render these connect-a-dot renderings? if so, can anyone explain in simple to understand terms? 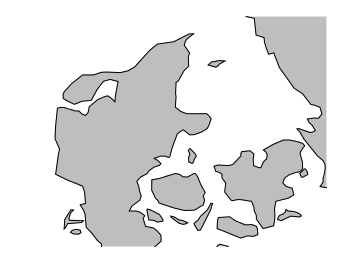 my desire with this technology is to draw a world map with a single lat.lon point highlighted. but IN ADDITION, to then overlay yet another geo shape file that would draw the outline of the country in which the single point resides. 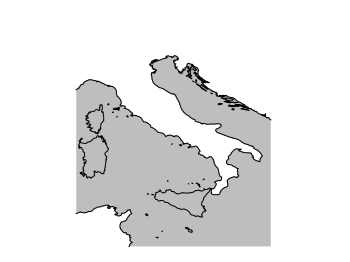 this brings up yet another question, but where can one obtain the data geo shape file for country outlines at the 10meter precision? must one pay for such data, or are there free sources? any help with this would be greatly apprciated. I wonder if it is possible to 1) draw the map of the world WITH country/border nations, including USA states, and 2) highlight some of those countries with different (filling) color. Initially the areas inside the borders can be white. Has anyone ever tried something like this with Gnuplot ? 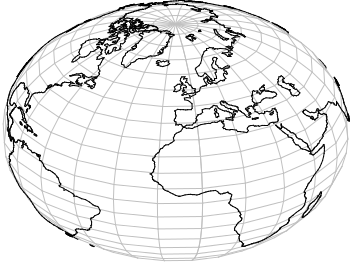 How to plot the map of Earth in 3D format with points only, without colorized surface?? following all valuable examples available on this site I’ve successfully plot the world map, either in 2d or in 3d. While plotting 3d world map using “set view” command I was able to center the map on a specific region; is there available an equivalent command to center a 2d world map on a specific meridian position? In other words: is it possible to have Americas in the central part of the map with Europe on the right and Japan on the left? It works but output is always including some wrong lines crossing the whole chart. Any hint on how to solve this issue? I’ve improved my solution adding a rounding function. Now the script is working properly with shifting =0.0 or >180.0 or <-180.0. In all other cases one or more spurious lines are included into the generated chart. # Centered as default: it works! # Forcing an error: it works! this image correspond with streets of a city with a squared area of N, S, E, W each 525 m from location point 51.05660 N, 3.721500 E.
I would like to plot a map of this place overlayed with my file which should match with the streets. Any idea of how I could compound an image like this or how I could get a squared map of the coordinates above and then overlay my image on it?